1).Hey, Didn't we just have a Major? Here we go again, the PGA Championship on Tillinghast's Baltusrol in Northern New Jersey. The PGA used to be known as Glory's Last Shot until the PGA Tour interfered and suggested the PGA Of America change their slogan as the FedEx Cup was really the pros' last chance at "Glory". But we're in New Jersey, Springsteen's manor, so let's just celebrate four Glory Days, even though the "speedball" will be rocketing off the face of a golf club rather than from the hand of a baseball pitcher. 2).It's perhaps unrealistic to expect a repeat of the thrilling duel between Stenson and Mickelson but a great field should produce its own thrills and spills as most of the players compete in the USA for the first time in a month. Henrik: "It's a boyhood dream come true, and something I wanted to achieve all my life, and then it finally happened." Phil: "It's the first time in my career that I have played that level of golf and not had it be enough to win a tournament." 3).Half a dozen golfers left Glen Abbey thinking they gifted Jhonny Vegas the Canadian Open win - happy to see Martin Laird secure his card and fleetingly stick his nose in front before treading water for his final few holes; and Kuchar & Snedeker will feel they squandered golden opportunities to wrap up their automatic Ryder Cup Team place. Kuchar, Fowler and Reed are all headed to Rio (for eleven days according to Rickie) so the guess here is that Davis Love has tipped all three the wink that their RC participation is assured. 4).After this week, the Tour visits Hartford, the Quad Cities and Greensboro and anyone out of the FedEx Top 125 points placings after that lot loses their chance at a Barclays tee-time, and possibly their Tour card for next season as well. Including Jamie Donaldson and it's looking increasingly as if he's given up on his PGA Tour membership - whether it's his schedule, his game or both, things don't seem to have worked out for him, professionally at least, so for him this possibly really his "last shot". 5).Phil has history on his side as he looks to get right back on his horse to "defend" the PGA Championship he won at Baltusrol in 2005; he then went on to win the very next Major, at Augusta in April, 2006, so he should relish the chance to go from disappointment to a relative comfort zone. Not much course form to go by there. 7).Baltusrol has the reputation as a bit of a tree-lined snoozer, all Par-3's and 4's except the Par-5's 17th and 18th: The 18th was the easiest hole in 2005, a reachable Par-5 but it has now been lengthened with a narrow driving area dominated by water alongside the fairway. Unless there's a following wind, only the longest/most reckless will go for the green in two, so effectively making it a lay-up off the tee, lay-up second shot, wedge, putt putt. Not guaranteed to stir too much excitement but perhaps the PGA can liven it up a tad? 8).I'm interested to see how the nouveau British contingent fares, Hatton and Johnston, Fitzpatrick (lousy form since Sweden) and Sullivan (has promised more than he's delivered this summer). And what about Willett (quiet summer for him) and Wood (beware the injured golfer?)? Of the continental Europeans, my each-way choice is Molinari, quietly having a fine summer and perhaps the sort of golfer that will play within himself, fairways and greens, and suddenly find himself in contention. 9).It's been hot and muggy in the New York area but temps are forecast to moderate to the mid-80's most of the week, with thunderstorms possible especially on Friday and Sunday. Hopefully the modest rainfall recently has been enough to ensure we won't have a repeat of Glen Abbey's brown out. Day, McIlroy and Spieth are Major-less this year; sounds like Day has had his practice restricted by family health concerns, but that change could be as good as a rest for him. Can't fancy Spieth but hopefully Rory will be somewhere close to his best. 10).Willett, Dustin Johnson, Stenson. Who's next in line as we seem to be enjoying a near epidemic of first-time Major winners? Answers please. The PGA Championship may be the Fourth Major in almost every respect, but it's still more important in our review of a golfer's legacy than the FedEx and WGC action. Hope the golfers feel the same. Cheers kwini. Everybody talks about how important it is to drive well. So with recent form in mind we can't really look past Sergio, Stenson, Rory and DJ. Great write up as always Kwini. For me this week it's Lee Westwood all the way, he's been banging on the door long enough, this week he blows the bloody doors off! and Kiradech has a great long name. Kuchar won't be down in Rio for 11 days. He listed as in the field next week which would make 5 weeks in a row in 4 different countries and 3 different continents. Bubba is also defending at Travelers. Reed and Fowler could find themselves well outside the top 12 of the RC list by the time they tee it up at the Barclays. Eight of the top 8 and 9 of the top 11 of the USA list all have RC and PC experience. I would hope DLIII would be looking for players with no scar tissue. Time for new blood, IMO. NO FUR-WRECK!! NO STRICKER!! DL-III mentioned Furyk about 15 times in his presser yesterday. UGH!!! We don't need his "expertise"
Late Wednesday evening and no sign of any withdrawals from PGA action. Disappointing for Cejka I imagine, being first alternate and in the hunt late on Sunday last week where a Canada win would have earned him a place in this week's field. Interesting that the PGA is looking at possible dates in 2020 given a slightly earlier Olympic schedule. Let's all work together this time . . . . .
And they're making it quite clear that any notion to take their Championship out of the USA is "on the back burner" for the foreseeable future. Good thinking. First tee-time tomorrow is 7.00 a.m., or noon-time BST. See you then. If I keep picking Sergio if he does eventually win one I will say I always knew it was coming. Plus his consistancy means he often pays for the stakes. I used to back DJ in every major but stopped after last year's PGA so there is no way I'm giving up on Sergio now. Apart from Sergio I think / hope Rory will be up there. Also the PGA has a habit of giving strong consistant pros their first major so Kuchar, Haas, and Snedeker will also see a little bit of my cash. I reckon J.B Holmes will do well this week. As for Sergio I don't think his swing will ever hold up under pressure, he relies too heavily on timing his lag and drop at the start of his downswing with the rest of his swing. What an oaf you are Mac, you know about as much about the golf swing as you do about course design. You just regurgitate what you think other people have said about it and are trying to sound clever and enlightened. Sergio has won a hell of a lot of tournaments in Europe AND America including the Players, of course, he hasn't won a major but his losses in majors when he's been close haven't been due to his swing letting him down, most often he's come up against someone who simply played better. Many people with worse swings haven't won a major and plenty people who have a worse swing and less consistency in ball striking have won majors. As usual, you're being a complete luddite. You don't get many better ball strikers than him and whilst he might not win a major, it's not true that his swing lets him down. His putting on the other hand, certainly has. I guess there is no way to test my idea that his swing is difficult to time under pressure but it sure looks like he has a lot of moving parts compared to the simpler swings on tour. Mac, When you look at the likes of McIlroy's swing, it looks incredibly poised, well balanced and that it will stand up to pressure because it is consistent, but he, like every other player on tour, can, if he's not playing well, be all over the place and he often is. So how do you account for simple swings also having just as many problems? Luke Donald's swing for example, is simple, smooth and repeatable, yet he's won no majors either. How someone's swing looks, is really only a matter of aesthetics. All these guys are incredibly good players, virtually any of them could win a major with those skills if we go on that alone. However, probably what is more important is how they mentally handle pressure, not how you think their swing looks. It's easy to blame a swing if someone somehow loses a tournament from a decent position, but it's not really the swing, it's the brain. Not sure if this is still the case - I am sure a composite course must have been used at some point - but in the 1954 US open Ed Furgol became the only player to win a major by playing on two courses. On the the 72nd of the Lower course Furgol hooked it into the tress on the left and then got a ruling that allowed him to pitch out onto a hole on the upper course, from where he played back to the lower course. The story is in the 1976 world atlas of golf. Composite courses are a good idea Mac. Think how much better St.Andrews would be if you could incorporate some of the holes from the Jubilee and New into an Open and take out some of the dross like 8,9 and 10 from TOC. Or how about a Major which was actually played over two or more courses, i.e. TOC and Carnoustie/Kingsbarns, perhaps like the Dunhill. Almost every golf hub in Britain could handle this. Is that correct about "composite" courses? It might have been in 1976, but am sure there have been more recent examples. Hope you're right with Sergio, wiretapper. Not sure about that, but Kuchar and Snedeker could be rewarding - Sneds would have won going away in Canada but his putter let him down badly - and he's a great putter! Still not on board with Grillo as a pick this week, maybe one day though. Who do you like out of your Aussie contingent? Good forecast for Round 1, but rain expected tonight and well into Friday. That'll become an issue if there's lightning and/or if the course floods. Should be OK Saturday, but storms still in the forecast for Sunday. I can't think of a composite course used in a major at the moment but didn't want to rule it out just in case someone knew better. Anyway, Furgol wasn't playing a composite course he just played from the other course at Baltusrol. 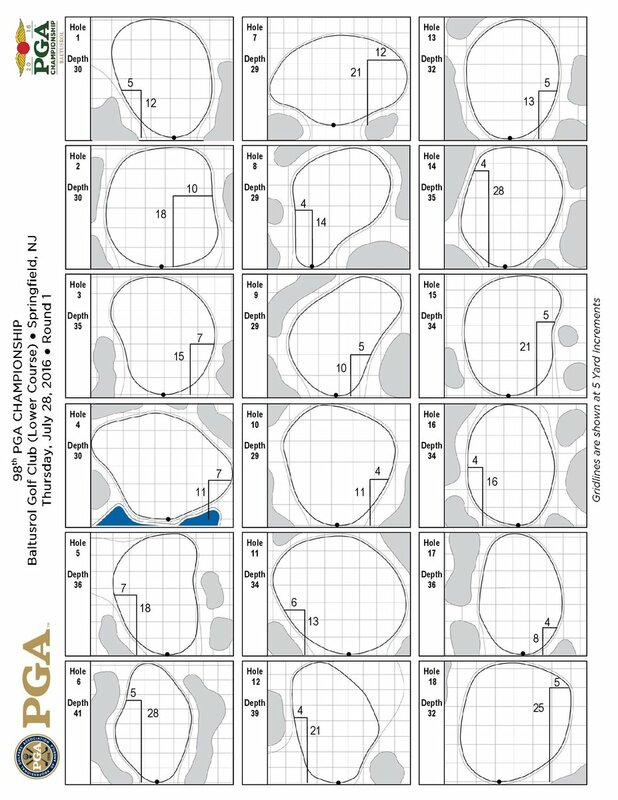 Certainly some courses on the Open rota aren't played in their usual order, not exactly composite course, but somewhere in between the actual course and another. Is anyone else sick of the Beef hype, we get it he is a character and seems down to earth but the media are going way overboard! Featured groups available on that link and also on the red sky button! sirbenson wrote: Is anyone else sick of the Beef hype, we get it he is a character and seems down to earth but the media are going way overboard! Is he even that much of a character? Take away the silly beard and look on his eating habits with Super's disdain and what is there? He is quite friendly towards the crowd and he says "man" and in the stuffy world golf can be at times they are not used to that I suppose haha! Would you rather have a few drinks or a meal with pea brained sergio or Beef? Beef appears to be a nice guy, so there is that beyond his facial hair and eating habits. I guess you could see it as the media exploiting him but so far Beef has used the attention to get a new bit of sponsorship and has used the crowd support to lift him on the course. I hope he continues to use this new found attention to his advantage. I'll answer that Mac as well.....Beef all day long he seems a nice guy, I am not criticising him, it's just more the media that I am criticising! Yes, you're right Mac and who knows how successful is golfing career actually will be so it's smart from his point of view to cash in on all the attention! Anyone know what sort of results Beef needs to make the Ryder cup? Have to admit, as much as Beef gives a bit more interest, apart from the Billy Bunter looks, adolescent vernacular in which he speaks, is he really that much of a character, or is he just 1% more interesting than the usual stiffs in the game? Aside from Stenson at The Open, he was probably the big winner, I'm sure he has some new sponsors chasing him after it, though not exactly sure what makes his "character"? Maybe all it takes to be considered interesting and "different" is to have a jihadi/Abe Lincoln beard, smile and speak in some sort of southern patwa. I like that he doesn't give a toss, but like Lowry, if he wants to be big in other ways than his fat body, he needs to screw the nut a bit. Two tee start .. is that normal? Davie wrote: Two tee start .. is that normal? For the US Open and PGA it is! Here are the Rd1 pin positions. Looked pretty tight. I guess the PGA don't want low round 1 scores. Torrance named as 5th RC VC. That should mean lw1 will get a WC? pedro wrote: Torrance named as 5th RC VC. That should mean lw1 will get a WC? Should mean Torrance's love child 9C gets a WC too. Seems like Beef and Daly are friends, first meeting in Germany in 2012. "He thought he could drink whiskey like me. That didn't pan out so good. He tried to keep up. And he just couldn't." Sick list update: Berger, Koepka and Wood have all teed off, bad news for Cejka. Good intro to the PGA and how some of the players see this week going. If he doesn't qualify then Lee is a guaranteed pick, I'd put my shirt on it. I'm moving house this weekend so I am watching stuff I have recorded on the V+ box over the years (I'm switching to Sky at my new place). Last night I watch the Miracle at Medinah, the Skysports documentary they showed a few months after that wonderful day. I have never been as emotional watching golf that day and even four years on watching the doc it was hard not to get caught up in it. When Majors (and the 1999 Ryder Cup) has been played at Brookline (The Country Club) it has used a composite course. I think it even uses a hole that doesn't even exist on either course as it uses the Tee and fairway from one hole and the green of another hole (from the other course). #11. I don't think LW would be a bad pick at all. He's got a great RC record, and has been in pretty decent form this year, certainly no worse than two years ago. I'd rather have his experience than pick a debutant as there will already be a lot qualifying by right, Europe could do with more experience. Kwin - Wonderful write up! And delighted Ryder Cupper Ed Furgol (from that golfing mecca of New York Mills, NY) was mentioned. Sergio may indeed do it this week, but I would NOT make that bet! His "lag" is in his brain. I think it's time for Rory to flex some muscles. I've played Baltusrol and it's the only time I had to use the "guest" showers in the main locker room. Odd. Lingmerth, English, and Fraser off to good starts. Lingmerth almost always seems to get off to a good start. Like Mac looking at his ceiling poster he shoots his bolt too early. The folks at Cedar Lake reckon that Dante Migliore is almost at the DB level - which would mean he must be certifiably thick not to be at a Div 1 school - impressive CC record so far though. Regarding composite "Championship" courses, pretty sure the Royal Melbourne lay-out is also a composite; Royal Montreal certainly is. I agree about Westwood comments, even for this week B_t_b; he's knocking on the door of the automatic RC qualifying places as it is. Unthinkable really that DC would leave him at home. Just a quick word on Beef. Anyway they got to meet plenty of golfers and got lots of autographs and photos but without a doubt Beef was their favourite. He took a few minutes to chat about getting into golf plus some tips and hints as well as the obligatory photo and autograph. My niece is 10 and her Dad is slowly introducing her to the game but after meeting Beef she wants a full set of junior clubs plus her Dad to take her every time he goes to the course. I do! There's enough RC experience in the Team not to have to pick out-of-formers like McDool. Kaymer, Soren and lw1 would make a solid three picks. PS: Good for Beef, great story . . . . . . I agree wiretapper, we need some personalities to get young people interested in the sport. Too many bland characters out there. Maybe it's just me who is cynical but I find the media are a TD condescending towards Beef!